Venezuela is running out of just about everything. Food, medicine, electricity, toilet paper, condoms -- you name it. And over the weekend at least two large international airlines -- Lufthansa and LATAM -- said they will suspend service to Venezuela in the coming months due to the economic crisis. The widespread scarcities and fleeing businesses reflect a country in crisis. "There's a shortage of everything at some level," says Ricardo Cusanno, vice president of Venezuela's Chamber of Commerce. Cusanno says 85% of companies in Venezuela have halted production to some extent. Venezuela's economy is spiraling into extreme recession. It is ironic given that the country sits on the world's largest proven oil reserves of oil. However Venezuela hasn't cut back from expensive government spending even as oil prices have lost half its value in the past two years. An oppostion-led Congress is pushing for the ouster of President Nicolas Maduro and people have joined rallies and protests calling for his removal. The country is under the spell of a drought, it's battling the Zika virus and people are struggling to get medicine in equipment-scarce hospitals. Toiletries are running in short supply across the country. Many Venezuelans say that people wait in lines for several hours to buy basic toiletries, only to sell them at much higher prices on the black market. Bloomberg reported last year that Trinidad & Tobago had offered to exchange tissue paper for oil with Venezuela. It's unclear if the deal ever came through. Condoms and birth control are hard to find, Venezuelans say. You won't have any more luck with toothpaste, soap, toilet paper or shampoo. 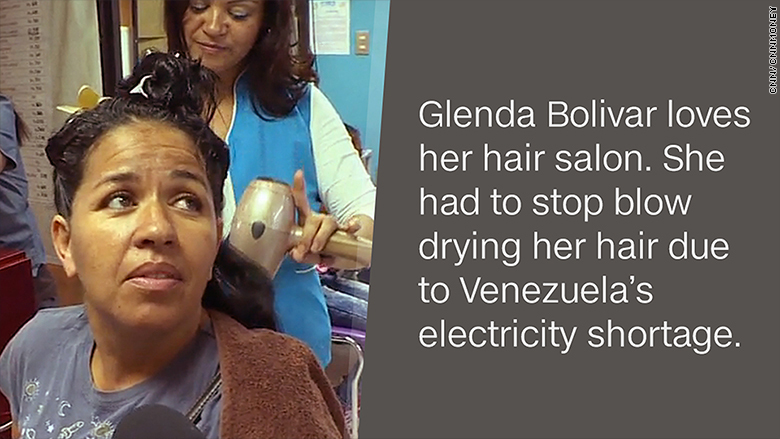 And Maduro has asked women to stop using blow dryers. Glenda Bolivar lives in Caracas. Blow drying her hair at her favorite salon had been a daily tradition but she recently had to stop. "Pretty soon, we will only be able to use candles like the old times," Bolivar told CNN in late April. Venezuela's government, running low on revenues and reserves, can't pay for sufficient amounts of imports for basic items like milk, butter, eggs and flour. The government has also significantly decreased sugar production due to government price controls and inability to pay for imported fertilizer. 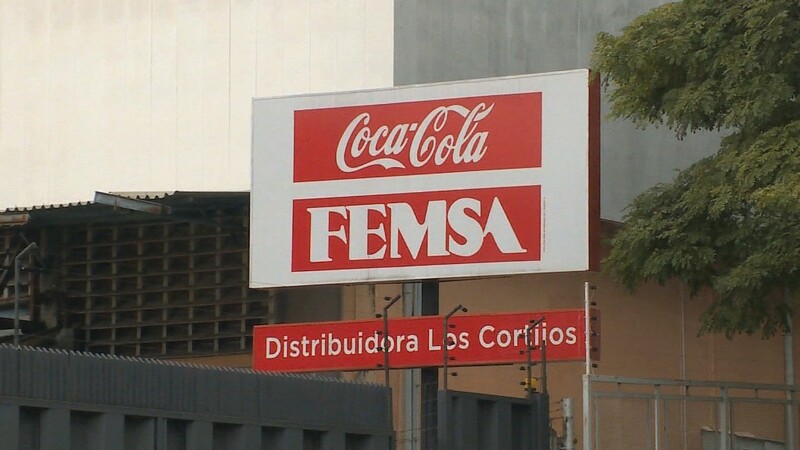 On Monday, Coca-Cola announced that it had halted production of Coke and other sweetened beverages due to the sugar shortage. Alejandro, a 23-year-old resident of Maracaibo, has learned to live without butter for a month. For a few weeks, he and his parents also learned to live without bread. They had arepas, a flour-based food, instead. On the unofficial exchange rate -- which many Venezuelans use -- Alejandro makes $57 a month working at a law firm during the day and teaching at night. Sometimes, Alejandro pays $2 for a case of butter -- or 4% of his monthly income -- on the black market so he doesn't have to wait in line for several hours. Despite his struggles, Alejandro says he's among the fortunate in Venezuela. "Everything here is just awful," says Alejandro (CNNMoney chose to withhold his last name). "There isn't one thing going right in Venezuela right now." Venezuelans now have rolling blackouts. The country's main source of energy, El Guri dam, is at record low water levels. To save energy, Maduro has instituted rolling blackouts in cities across Venezuela for at least April and May. He also cut the work week to two days for government employees. When Alejandro teaches his night class, he uses the flashlight on his cell phone so the students don't have to be sitting in the dark if there's a power cut. Maracaibo has lost electricity for 3 hours a day in May. Venezuela lacks roughly 80% of the basic medical supplies needed to treat its population, according to the Pharmaceutical Federation of Venezuela. People are dying in hospitals for lack of sufficient medicines and equipment. Jose Luis Vazquez experienced the nightmare firsthand. He had just survived a gunshot wound to the chest in a robbery attempt and doctors said all he needed was minor surgery. But he was still in the hospital days later and he had to pay for all the supplies -- gauges, syringes, peroxide and more. 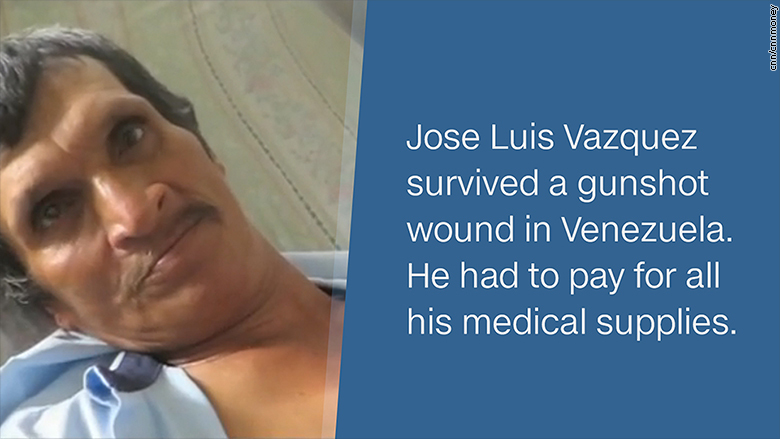 "There was nothing in this hospital," Vazquez told CNN earlier in May in a hospital in Valencia, a city about 100 miles from the capital, Caracas. Venezuela's government has been running out of foreign reserves and literally shipping gold to help pay for its debt. Venezuela only has $12.1 billion in foreign reserves as of March, according to the most recent central bank figures. That's down by half from a year ago. In order to get cash loans to pay for its debt, Venezuela has shipped $2.3 billion of gold to Switzerland so far this year as collateral, according to Swiss government import data. Experts believe Venezuela will likely default on its debt this fall. "Things continue to devolve in Venezuela," says Russ Dallen, managing partner at LatInvest, a firm in Miami that invests in Latin America.